Long story short – shorts are no longer limited to pool parties. With the likes of Prada and Thom Browne (among others) putting their names to the tailored short, menswear is awash with a wave of party-ready prints, swim shorts you can wear out of the water and even work-appropriate options (depending on your work, of course). But, where exactly can you wear legitimately wear shorts? As summer hots up (cheers, global warming) and menswear becomes increasingly casualised, where do we draw the line? Can we ever wear shorts to a wedding? And will Jane from HR ever allow you to get your legs out on the nine-to-five? Yes to all of the above – bearing in mind a few rules, of course. Read on for our decisive and definitive summer shorts selector. Balmy temperatures are undoubtedly the best thing about summer nights out, when a relaxed pub garden visit can turn into a 6am session quicker than you can say ‘guestlist’. However, there are several things to to bear in mind if you want to both meet the bouncer’s standards and swerve heatstroke. Okay, okay, we get that no matter how casual your Friday at PwC, shorts will never cut the mustard. 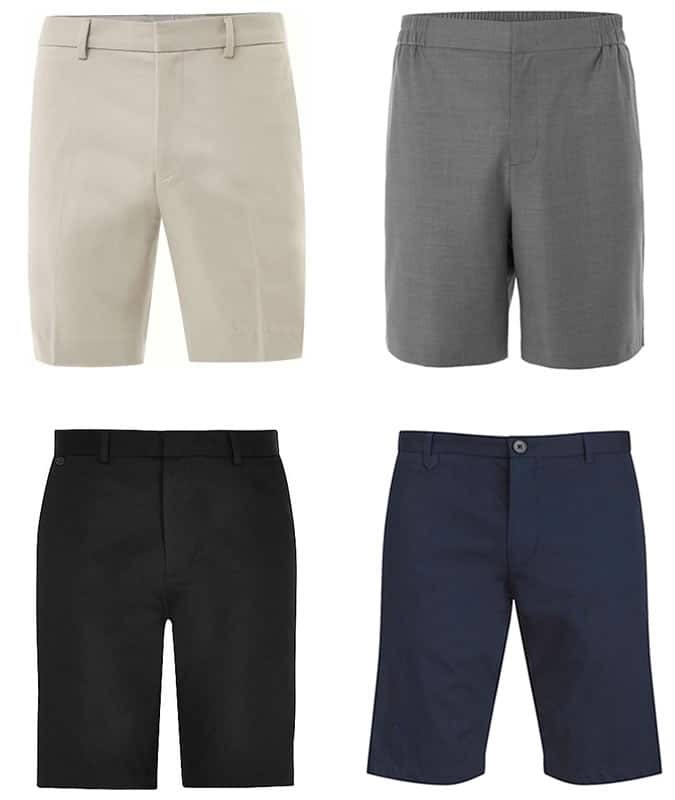 But if you’re working for an agency or in a more creative environment, rules may be a little laxer, making shorts a savvy workwear choice (weather depending). And, just as you can melt in a nightclub (see above), many a tiled ceiling workplace comes without air conditioning, which means cotton takes the driving seat once more (with the window wound down, please). Weddings are one of the last bastions of suiting. Despite suggestions to mix and match, unbutton your shirt slightly or opt for a pocket square over a tie, the formality of occasions that call for suits mean that while a cropped trouser might be passable, shorts aren’t. Unless you’re going abroad. Your liver might already be taking a battering on account of those boozy afternoons summer is synonymous with, but don’t let your style standards slip before you get tipsy. As you start to spend more time in your pub’s beer garden than your own, it’s worth opting for a pair of hardwearing shorts that will withstand a few washes – because there will pint dribbles. So many pint dribbles. And maybe even fag ash. Knee-length denim options are a good route to go. Although not as breathable as their cotton and linen counterparts, denim shorts are durable and transition well to the evening. Better yet, a dark colour will hide most stains and combine well with a shirt come sundown.